March 23, 2016 Emily V.
If you asked me a year ago how I felt about sneakers a comment revolving how they are perfect for exercise would've been normal. The only suitable 'sneaker' I wore for non-exercise are my Converse and I love my Converse. However, today I'm singing a slightly different tune. And I have these rose gold metallic New Balance sneakers to blame. When I saw the grey with metallic rose gold combo early last year I had to have them. They are so cute aren't they? Since then I've been lusting over more sneakers than I care to admit. I couldn't resist this pair of Nike's. Brands have definitely up'd their lifestyle sneaker game & athleisure is definitely on the style front. 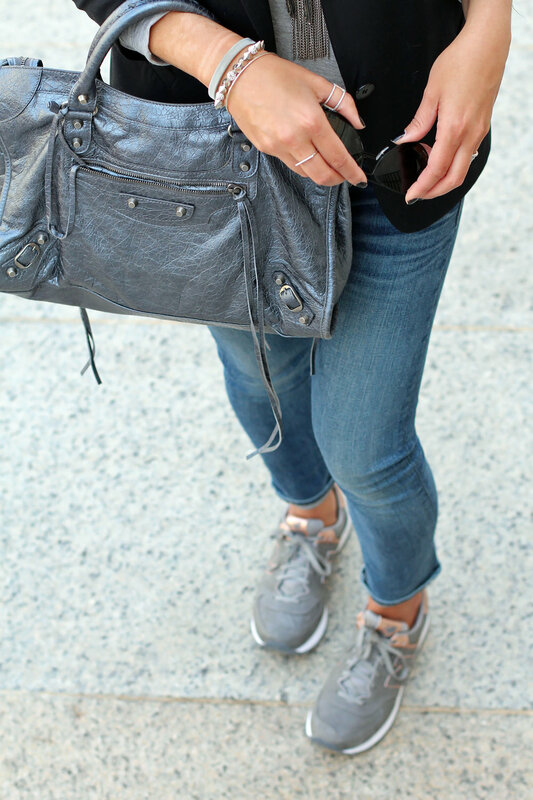 My favorite way to style lifestyle sneakers is to pair them with skinny jeans & show a bit on ankle. Also, in keeping with one of my go-to closet must-haves, a blazer makes the looks casual but still chic. Have a great day & thanks so much for stopping by.